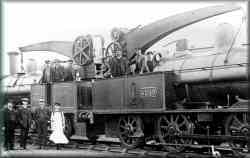 Two ‘Crane Shunters’ back to back, probably in the works during the early 1900s. Both engines have three-ton cranes with jibs secured ahead of the Dome . Earlier engines in this class had four-ton cranes that had shorter jibs, which secured behind the dome.